You shouldn’t really ever analyse Queen. You should celebrate them. Always prepared to be adventurous, the band started with a firm hard rock foundation from which they touched on almost every possible aspect of music. What made Queen remarkable is that they did this without compromising, yet they still gained enormous mainstream success. They found the secret of bringing fans — in their millions — to them, rather than the reverse. The Queen catalogue is frothing with songs which have become signposts for successive generations. Here are their 15 studio albums, covering two decades, ranked from worst to best. A posthumous album, this featured vocal and piano parts recorded by Mercury in the months before had died. The tracks were subsequently finished by May, Deacon and Taylor. While there was a lot of emotion invested in completing the album, it is nonetheless very disjointed and, at times, confused. It’s clearly not a proper band album, and without Mercury giving his insight and input, the music suffers. There are occasional glimpses of Queen class, such as on A Winter’s Tale and You Don’t Fool Me, but overall it was probably more a cathartic exercise for the three remaining members than anything truly fulfilling for fans. There are no total duds in the Queen catalogue, just albums which are comparatively disappointing. Of these, Hot Space is certainly one of the most culpable. It was Queen’s slightly misguided attempt to break into the dance market, and while they had the musical chops to carry this off, the whole thing comes across as a patchwork, inconsistent record. The main problem isn’t the style of the music, it’s the songwriting. With the exception of the excellent Under Pressure (a collaboration with David Bowie) and the engaging Body Language, the rest of the album falls short of the standard Queen fans took for granted. This was the soundtrack to the uproariously camp film of the same title, and given the nature of the movie itself, Queen were the perfect band to come up with the music. They did a fine job, but without the visuals much of the music’s impact is lost. In fact, it’s almost entirely instrumental, which is what you’d expect for a soundtrack. Only Flash’s Theme and The Hero had lyrics. The former is the most well known song here, and perfectly sums up the serious yet spoof nature of the film. Like the characters on screen, Flash Gordon as an album was hilarious, because it was done with a completely straight face. Working with German engineer Mack gave Queen the opportunity to expand their sound and bring in some electronic influences. This would become more pronounced on Hot Space, but they worked better when kept more as an undercurrent on The Game. There were some landmark songs such as Another One Bites The Dust, Save Me and Crazy Little Thing Called Love, but also deeper cuts that were far from fillers. Dragon Attack and Rock It (Prime Jive) are perhaps among the most underrated of all Queen tracks. The Game trumpeted a new era for the band, although what followed slightly derailed them. In some respects — like Flash Gordon — this was a soundtrack album. Six of the songs were included in Highlander, and while A Kind Of Magic was never written and recorded as a soundtrack album, it became one by default. The style here swept across the rock spectrum, accentuating the band’s strengths along the way. And wherever they trod, Queen still managed to be grandiose in the manner only they could achieve. Songs like A Kind Of Magic, One Vision and Who Wants To Live Forever quickly became iconic, while the piano ballad Friends Will Be Friends and the heavy Princes Of The Universe were hardly slouches. This was originally going to be called The Invisible Men, which would have hardly been appropriate for such a high profile band. The mix of styles ranged from the progressive title track to the pomp pop flow of I Want It All and the electro funk of The Invisible Man (which namechecked all four members in the lyrics). Scandal was especially noteworthy, being written by May as an attack of the UK media, who’d hounded him over his developing relationship with Anita Dobson, and also for the way they treated Freddie Mercury as he battled AIDS. Although swathed in synth sounds, the album is triumphant thanks to Mercury’s stunning vocals and May’s agitated guitar work. The balance between all the styles worked out better than might have been feared. The last true band album, Innuendo had a lot of intelligent humour and pathos about it. Delilah, for instance, is about Mercury’s cat, while I’m Going Slightly Mad is a song about, well, madness, but it’s done in the reverie style of Noel Coward. The title track — which had a guest appearance from Steve Howe — began as a jam, before being opened up into a flowing track that incorporated some brilliantly synthesised orchestrations. Perhaps most poignant of all is the low key yet mesmerising These Are The Days Of Our Lives, which ended with Mercury’s whispered paean ‘I still love you’, which was moving in its simplicity. The album summed up how Queen could draw people close, yet still keep them at a convenient distance. A satisfying album that worked the band’s hard rock roots back into the equation without sacrificing the electropop and funk strata they’d been embracing over the previous few years. The alliance of these styles worked in a smooth manner. Perhaps taking a break after Hot Space had re-energised them all for the challenge of a new Queen album. Whatever the reasons, The Works pressed all the right buttons. Hammer To Fall was a vibrant return to guitar-saturated power. I Want To Break Free is perfect mid-80s pop/rock – with the striking video clip featuring the band in drag! — and Radio Ga Ga was… well, it was Radio Ga Ga. The rest of the album also caught and held the attention. The band had rediscovered their desire to be leaders of the pack. Yes, the album’s got We Are The Champions and We Will Rock You, two songs so embedded into the social fabric it’s easy to forget their origins. So it’s also easy to see News Of The World as being about these tracks and nothing else. But that does the album a massive disservice. There were plenty of other highlights - Sheer Heart Attack (which the band had never quite finished in time for the album of the same title), Spread Your Wings, Get Down. Make Love. This was the band in high spirits and musically flying. It continued the strong run of albums, while also proving they weren’t prepared to stand still and merely repeat a winning formula. Queen II is arguably the heaviest Queen album. Ogre Battle hit the metal trail, The March Of The Black Queen offered prog-rock retribution, Father To Son was eerily catchy and Nevermore was a prime-cut ballad. Stylistically there was nothing here that wasn’t on the superior debut, and you can hear the band struggling with the traditional ‘difficult second album’ problems. 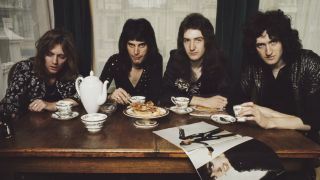 Queen II marked end of the first phase of the band’s career. They had pushed their rock and metal roots as far as they could, and were clearly looking to jump off the train and expand their horizons. It’s probably for this reason that the album lacked the sparkle and bite of Queen and the audacity of the subsequent Sheer Heart Attack. Many bands who had achieved even 10 per cent of what Queen had with A Night At The Opera would have sat back on their success and ridden the wave. But not Queen. From the opening fanfare that led into the relentless Tie Your Mother Down, you know this isn’t going to be a wishy-washy follow-up to …Opera. Somebody To Love had succulent gospel harmonies, Good Old Fashioned Lover Boy owed something to Noel Coward, and White Man took a political manoeuvre into Native American territory. The band also showed their ability to surprise on Teo Torriatte, which included Japanese lyrics. As Queen were one of the biggest bands in the world, it gave them a mandate to be innovative. It’s often criticised for being a little too off-the-wall and idiosyncratic for general consumption, yet Jazz offers some of the most satisfying moments in Queen’s career. Titled more for the fact that the band now felt they could go anywhere musically than for the style of the songs, Jazz took some extreme turns. Mustapha had a middle-eastern sense of humour, Fat-Bottom Girls was a cod-macho piss-take and Bicycle Race offered up some neat Carry On-inspired double entendres. Don’t Stop Me Now was the Broadway song Cole Porter never wrote, Fun It had disco pretensions, and Dreamers Ball came straight off the music-hall stage. Jazz wasn’t a true rock album, but its spirit reflects the fact that nobody understood better than Queen what rock music could achieve. Queen’s third album saw them developing their style into more diverse areas. They still had the hard rock roots with Brighton Rock, Killer Queen and Stone Cold Crazy among the finest fist-pounding anthems Queen ever recorded, while Roger Taylor’s Tenement Funster was a classy tribute to youthful rebellion. The band dipped their toes into ballad territory with Dear Friend and Lily Of The Valley, there was a distinct Caribbean flavour to Misfire and a touch of ragtime on Bring Back That Leroy Brown, and In The Lap Of The Gods… Revisited was an epic moment that would prove to be a stage favourite. Sheer Heart Attack had a sense of joy and attitude about it that, years later, can be put down to the band’s growing confidence. Queen just knew they were on the verge of something spectacular. A glorious hard rock marathon unlike anything else around at the time, this album started it all. Maybe it was the unmistakably unique sound of Brian May’s home-made guitar. Perhaps it was the panoramic production of Roy Thomas Baker, or the soaring voice of Freddie Mercury. Whatever the secret, Queen was one of those scary albums that simply burst its seams. The record was just too powerful, too multi-dimensional and too stunning to sit happily and contentedly in the grooves. The performances were all virtuoso. And those songs… oh, those songs: beginning with the cast-iron Keep Yourself Alive, breathless and languid in the same phrase, then Great King Rat, Son & Daughter, Liar, and finishing with a brief, early instrumental version of Seven Seas Of Rhye. This was the stuff of legend.. Yes, the one with Bohemian Rhapsody, the most played and analysed rock anthem ever. It’s a song nobody in their right mind would dare try to cover – well, apart from Bad News, Fuzzbox and Elaine Page — but this was just one jewel in a crown cluttered with precious gems. …Opera was the record where Queen really delivered in terms of diversity. You want metal? There’s Death On Two Legs and Sweet Lady. Pop? I’m In Love With My Car and You’re My Best Friend. Camp ditties? Seaside Rendezvous and Lazing On A Sunday Afternoon. Even a proggie moment: 39. Finishing with God Save The Queen was a moment when pretension, ego and self-deprecation collided perfectly.